Aligned with HMH Journeys 2011, 2014, and 2017 copyrights. 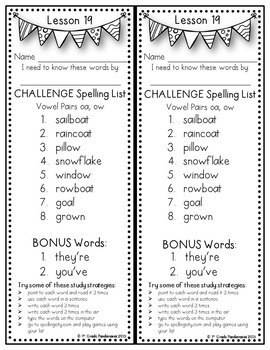 Differentiate your first grade instruction and challenge your spellers with Grade 1 Houghton Mifflin Reading weekly Spelling CHALLENGE spelling lists (copyrights 2011, 2014 and 2017). 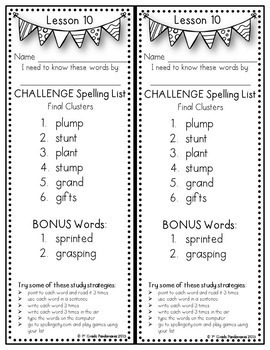 Send these lists home with students who need more challenging lists at the beginning of each week. 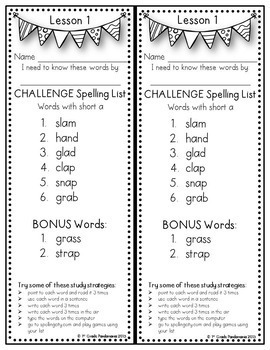 These lists follow the same weekly sounds/skills used in the regular spelling lists. Just print them off each week on a different color paper to differentiate from the regular list that other students get. 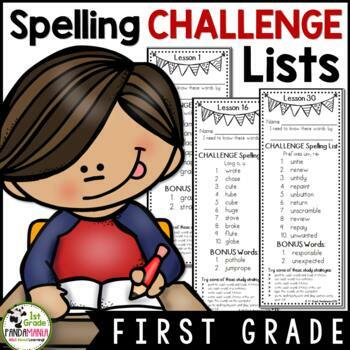 Included are all lessons 1-30 spelling lists. Check out our Houghton Mifflin Sight Word Bundle! Please note: These materials were prepared by 1st Grade Pandamania and have neither been developed, reviewed, nor endorsed by Houghton Mifflin Harcourt Publishing Company, publisher of the original HMH JOURNEYS work on which this material is based. Permission has been granted from HMH Journeys to use their curriculum to create this resource.